Is financial clutter getting you down? Do you see bills, tax documents, and bank statements everywhere you look? If you are like millions of Americans, your financial documents are anything but organized. Rather, they’re scattered from one end of your home to the other — under your bed and in the kitchen cabinet. Do you know where to find what you need? Organizing your financial documents may sound like a tough task. It is. Fortunately, once you have a system in place and see how easy it is to get by when you are organized, you’ll never look back. If you’re fed up with your financial clutter, follow these five steps to get organized. Pro Tip: Use hanging folders in a filing cabinet for optimal organization. Just label each folder according to its contents, like taxes, bank statements, insurance, savings, and bills. If you’re keeping track of personal or business receipts, Shoeboxed can help by scanning and organizing your receipts for a small fee. The toughest part of organizing is getting all of your documents in one place. Do you know where to look? Are you willing to spend a couple of hours on this step alone? In this early stage, you don’t have to worry about being neat. Just get everything in the same place, so you can weed through the clutter and then start organizing. Of course, you’ll find a lot of subcategories, but this checklist will give you some goals as you search the different rooms of your house for your old paperwork. Once you’ve gathered all of your statements, receipts, and other files, you’ll realize one thing: Sorting is going to be a time-consuming process. You can’t avoid it. But you can make efficient use of your time. First and foremost, consider the checklist from step two. Designate an area of your desk or table for each of the categories, and just do some top-level organizing. Once you have all of the papers in their general areas, you can see which topics will be the toughest to tackle. Those are the ones to go through first, and you should break them down into subcategories. For insurance, for example, you’ll use separate folders for car insurance, health insurance, and life insurance. After you get your piles ready for subfolders, sort each one in chronological order so you can easily find the right statements when you need them. Pro Tip: Once you’ve gathered all of your paperwork, try to gauge how much time you’ll need to sort through everything. Organizing your financial documents is not something to do to pass time during commercial breaks or while the coffee’s brewing. You might need two or three hours, so set that time aside so you can avoid distractions. Believe it or not, getting organized is the easy part. Staying organized is much more difficult. If you’re not careful, you’ll quickly end up right back where you started. Don’t turn your hard work into wasted time. Once you’re organized, every time you receive a new financial document — even if it seems insignificant or it’s been a long day — make sure you put it in the appropriate folder. Pro Tip: I’ve always had issues in this area. At the beginning of the year, when I am getting ready to file my tax return, I get organized. Everything looks good up until April or May. Soon enough, as summer settles in, things get out of control again. To solve the problem, I’ve made filing part of my daily mail routine. Instead of skimming through mail as I walk through the door, I sit at my desk to open my mail, and I immediately put financial statements in their appropriate folder. I also shred anything that I do not need to keep. Staying organized also means knowing when to throw things out, otherwise your clutter will pile up again. While you need to keep many documents, like tax returns, do you really need that grocery receipt from 5 months ago? What about your bank statement from July 2008? Pro Tip: The IRS suggests that you keep tax return information for seven years. That sounds fine, but I don’t trust them. Instead, I keep all of my tax documents no matter how old they are. As long as they are organized they don’t take up much space. Money mail probably appears in your mailbox almost as frequently as junk mail does. If you’re overwhelmed by utility bills, bank statements, and quarterly retirement updates, you need a system in place to stay organized. If you keep tossing paperwork in the same overflowing box, it’s almost as bad as not saving the paperwork at all. When the phone call comes, will you be prepared to find the one statement you need to refute a bank error, or defend an old tax deduction? 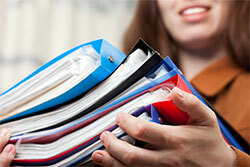 Organizing your financial files isn’t just a spring cleaning project. It’s a year-round process, and if you follow these five steps you will be well on your way to success. What tips and tricks do you use to stay on top of your filing system? I have seen so many people knowing well the importance of record keeping. Yet they procrastinate over it and linger on this important task of organizing the financial documents. Shredding. That’s the hardest one for me. I have 3 printer paper boxes of documents that I just can’t bring myself to shred. Don’t ask me why. Nostalgia? I really need to take care of that. Thank you. I cannot stand having my documents messy. When you need something, you can’t find it! I have everything in file folders and color coordinated. It helps me to feel like I know where everything is. this is such a big eye opener. I can see a lot of people following the steps you are mentioning. The one that I have the most problems with is step #5, know when to throw things out. One of the things that I have thought about but haven’t put it to practice is scanning my documents, and keeping them saved on a hard drive. Great post! I usually don’t print out my bank statements. I know they are available online through online banking, so if I ever had a need to look at one, I could just look it up online. Saves clutter and it’s more secure than storing it at home. I like keeping track of my correspondence online. Like Pam says, it saves clutter and it is more secure than storing it at home. I like the advice you are providing on this post. It is definitely a good foundation to get a fresh start and change some habits around. Maybe to add and emphasize what you’ve written, keeping organized is easier if done in small bits and consistently. I find it easier to organize such documents fortnightly and at the end of each month, quarter etc. This makes it easier keeping track of things! Find your advice very practical, thanks! This is to be fact that when we are in need then we became mad to find the important docs. But if we are aware a bit and keep our important documents with well organized then it could be very easy to find when needed. Thanks buddy to focus on some easy way to organize the important financial documents by your article. I think some folks hesitate to get organized, because then they have to deal with financial reality! I know this was the case for use, years ago, before we started to dig out of debt and save money. I found that the paperwork was much easier to deal with – once we had a sound financial plan in place! Great post. Rock on. I think one of the problems some people have is starting out with good intent, and then getting lazy and disorganized. The reason? The benefits of their better organization have not been seen because they have had no need of any of the documents they so carefully filed. Sometimes it is only years later that the real benefit of good organisation becomes obvious, when you suddenly need a certain document and know exactly where it is. Very good tips. The key in all of this is to be consistent, after you were able to set it all up. Otherwise it’s back to square one. My parents had given me one solid advice when they got to know that I was applying for a credit card. It was to file all my statements in a folder and arrange them date wise. I did that and today I realize how simplified my life is. As when I went in to apply for a personal loan, most of my documentation was well organized. Try it, you will thank me. One more thing we can do by always saving a soft copy of each important financial document into your PC. If by chance you loose any item then soft copy will helpful some matter. Yes, for saving photo copy you have to set different folders in your PC. It may be a time consuming process but more safe. If you have 24×7 online connection then another option also helpful for you. There also cloud storage services make it easier and better to for Keep your financial documents organized. Try to do experiment with it. The Consumer Financial Protection Bureau just secured its first settlement which it wrestled away from Capital One Bank in the amount of $150 million for its aggressive and misleading marketing of credit card add-ons. Capital One will have to reimburse more than 2 million customers for fees for services such as credit monitoring and payment protection plans.